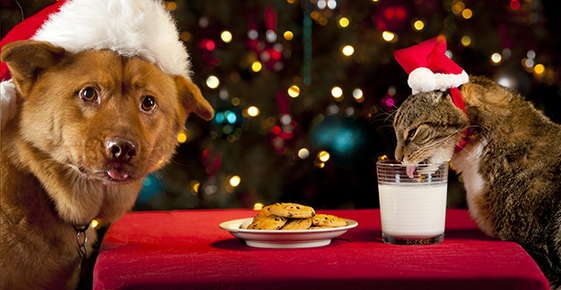 The holidays are fun, even for pets, but the season brings added danger for animal companions. Learn to recognize and manage holiday hazards to keep your pet safe during the festivities. Tinsel is attractive, especially to cats. Tinsel is not toxic but consuming tinsel can cause serious harm to your pet’s digestive system. The long, tough strands can actually cut through the intestine and cause peritonitis. Pets love to play with bright, colorful ornaments, but may end up breaking or even chewing and swallowing these fragile decorations. Sharp, broken pieces can lacerate the animal’s mouth, throat, and digestive tract. Larger pieces can cause an obstruction and emergency surgery may be needed. Cats love to climb trees, especially when the tree is indoors and loaded with ornaments and other decorations that look a lot like cat toys. A climbing cat can pull a fully decorated Christmas tree crashing to the ground, potentially injuring the animal. Tree water may contain dangerous fertilizers and stagnant tree water may contain unhealthy bacteria. Consuming holly may cause nausea, vomiting, and diarrhea. Eating mistletoe can result in stomach upset and even heart problems. A cat may suffer kidney failure after ingesting some types of lilies. A dog or cat that eats chocolate may experience vomiting and diarrhea, panting, hyperactivity, abnormal heart rhythm, seizures and, in severe cases, even death. The darker the chocolate, the more toxic compounds it contains. Dogs and cats love turkey but this holiday fare may be dangerous to their health. The immediate pet hazard associated with turkey are the tiny bones that, if swallowed, may cause painful constipation or even splinter to perforate the stomach; both conditions require immediate veterinary attention. Feeding rich and fatty food like that served at holiday parties can cause vomiting, diarrhea, and even inflammation of the pancreas. Raw or undercooked turkey can contain Salmonella, E. coli, or Campylobacter bacteria that can lead to food poisoning. The herb sage contains essential oils and resins that add flavor to turkey and other holiday foods but this herb can cause an upset stomach and even nervous system problems in pets – especially cats. Consuming raw bread dough is dangerous for pets, as heat from the animal’s body causes the dough to rise inside its stomach. The pet may experience vomiting, severe abdominal pain and bloating. Any pet encountering these holiday hazards may need immediate veterinary care for a complete examination, blood tests, x-rays, medications, and even surgery. Make this holiday season merry for everyone, including your pets, by keeping pets safe from these potential holiday hazards. ASPCA, “Holiday Safety Tips.” 2014.